Canape & Finger Food Catering in Christchurch, NZ | Call Us Now! We craft plates of individually tailored canapes that are designed to please your guests and clients. Our delicious appetisers can be delivered ready to serve or made fresh on-site, if the kitchen facilities are available. If you have a cocktail party, intimate wedding, champagne reception or corporate event coming up, The Bespoke Chef specialises in creating attractive canape dishes and hors d’oeuvres to pass around and spark excitement throughout your occasion. We bring the catering to you. Our dedicated chefs craft menus that are full of bold flavours and unique finger food, so you and your guests can enjoy gourmet tastes created especially for you. For a superior canape experience, presentation is key. We put years of experience and commitment into our canape catering for Christchurch events, so every mouthful is delicious. Make an impact with unique platters of bite-sized finger food to suit all tastes and styles. The Bespoke chef sources fresh ingredients, premium seafood, meat and vegetables from trusted local suppliers. The pure quality of our ingredients is clear to see with every bite. Whatever the occasion, we create a menu that complements it to perfection. Tell us more about the style of function and we will build an unparalleled catering experience to match. The Bespoke Chef is able to provide event and in home catering to suit a variety of budgets and tastes. Let us know about the size of your party and about any taste preferences or dietary requirements, and we can work with you to put together a menu that you will love. Explore our sample menu below and contact us to find out about our extensive list. For a unique style of finger food catering, a canape spread is perfect for events in Christchurch and the surrounding areas. We only provide recipes that we’re proud to make. There’s no limit to how well your guests can dine at your private event. When you invite The Bespoke Chef to bring catering and canapes to your home or event, you’re inviting restaurant quality to the occasion. 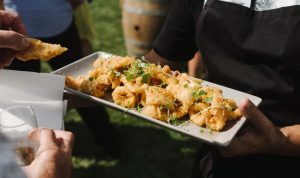 With more than a decade of experience in some of New Zealand’s finest restaurants, learning from award-winning chefs, The Bespoke Chef, Jacob, can promise a memorable catering experience full of tasty morsels. Let us know about your upcoming event. We can cater for intimate, boutique weddings, in-home dining and more. Let Jacob take care of the entire cuisine, with immaculately-presented dishes, high-quality seasonal produce and exceeded expectations. Extensive list and pricing available on request.